So much for the number 13 being bad luck! I’m a huge bird fan and I feel truley priveleged to have gotten this photo. I would have been very happy just to have gotten photo’s of the nest, so the birds are like striking gold! I’m still learning to use my new Nikon D40x which means I am still prone to making basic mistakes. It’sfrustrating in some ways (ok, many) and I could have spent much longer at the nest attempting to get perfect photos. However the birds themselves are more important to me and I decided to respect there space and back off. Mother bird flew away when I came by and I didn’t want to be responsible for her not coming back! 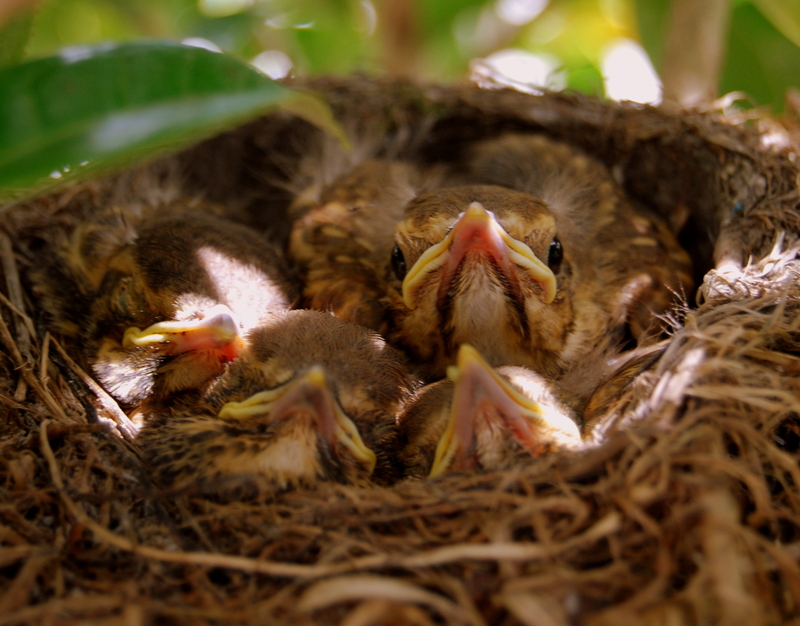 The only other time that I can recall seeing baby birds as young as these was when I was a kid and I found a nest that had fallen from a tree, the almost featherless still birds inside. I’d just gotten off the school bus so took off my sweatshirt to wrap up the birds and then took the whole lot home in my lunch box! Guess it was a sign of things to come! INTERNATIONAL BLOG ACTION DAY…I just read this great post about not letting the burst of enthusiasm you may have felt on blog action day fade away. The writer says that ‘the road to hell is paved with good intentions’ and encourages readers to commit to doing something about poverty. Don’t let the dust settle around you! Remember…Acknowledge it and then take ACTION! That’s a fantastic shot! Such cute little birds! Awesome – what luck! I share your excitement! Besides being an awesome photo, what a perfect picture for you: a Mom with her own little chicks who loves to make nests.